Elegante Mahagoni Bureau von Maple & Co.
An Exhibition quality mahogany, satinwood and marquetry inlaid 19th century Carlton House Desk made by the renowned London firm and suppliers to Royalty, Maple & Co. Stamped to the central drawer. English, London made, circa 1880-1900. Of mahogany construction, crossbanded in satinwood veneers and inlaid with stunning exhibition quality exotic wood engraved marquetry consisting of musical trophies, shells, anthemia, urns and foliage. The rounded superstructure surmounted with a rare inlaid wooden gallery centered by an inlaid musical trophy, below having a central door flanked by three drawers and a curved door. Each door being lockable, marquetry inlaid and satinwood banded with the drawers similar having central brass knob handles. To each end there are hinged curved compartments with central musical trophies which open backwards each revealing a mahogany lined drawer. The sliding forward central writing surface has been newly fitted with a Royal Blue gilt and blind tooled leather insert having a boxwood strung border below a larger twin handled drawer flanked to each side by two short drawers each being inlaid with central anthemia and scrolling foliage with an engraved brass handle crossbanded with boxwood, ebony and satinwood. Supported on elegant square tapering legs, the tops having inlaid ribbon tied trailing flowers each being boxwood strung finished on spade feet and original brass castors. The back and sides also being profusely inlaid on six separately boarded panels, three to the superstructure consisting of classical urns with foliate inlaid scroll design and three to the lower section consisting of a central inlaid shell motif surrounded by similar scrolling foliate design. Offered in excellent condition having a superb color this antique Carlton House Desk by the renowned makers Maple & Co. is the best and finest model they made. Very rare to the market this desk with make a fine addition to any home or collection. The London firm Maple & Co. which was based in Tottenham Court Road, but also had a branch in the Rue Bourdeau in Paris were proud to publish their clientele, besides most members of the British Royal family, included 'H.I.M. The Czar of Russia, H.I.M. The Empress of Germany, H.I.M. The Empress Eugenie', also 'The Royal Family of the Netherlands', and even 'H.M. The King of Siam’. This desk is identical to a Cartlon House Desk supplied by Maple & Co to De Haar Castle which was a Dutch castle owned by one of the Rothschilds which was rebuilt and furnished by them in the late 19th Century. This desk was listed in the Maple & Co sale (supply to De Harm Castle) catalogue as an ‘Exceptionally Fine Satinwood Inlaid "Carlton" Writing Table', which is listed as 1007 B in the 'Drawing-room furniture' section of the sale catalogue and cost 30 Pounds. Sold at Christies Amsterdam 13th October 1998 it realized a amazing £71,498. The Carlton House Desk is thought to have been named so after being a design in the late 18th Century by either George Hepplewhite or John Kerr for the Prince of Wales (who later became George IV) for his London Residence, Carlton House. The desk resembles a normal writing table, but small drawers above the surface form a "U" shape around the user, instead of merely facing the user as in a typical bureau à gradin. 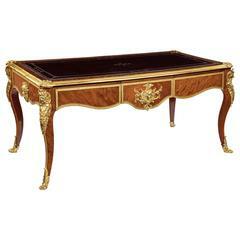 Unlike other types of bureau à gradin, the Carlton House desk usually offers no pigeonholes. There are usually small slopes over each of the desktop drawers at the left and right ends of the "U" shape. Drawings of this type of desk were presented by Hepplewhite in his noted design book, The Cabinet Maker and Upholsterers Guide and Thomas Sheraton his own book of designs, The Cabinet Maker and Upholsterer's Drawing Book, thus ensuring its popularity. Dimensions: Width 53 1/4 inches - 135.5cm Height 39 1/4 inches - 99.5cm Depth 26 1/4 inches - 67cm Knee height 23 1/2 inches - 59.5cm.